A barista served the popular grande white chocolate mocha drink to a customer with a label on it that read “DIABETES HERE I COME”. Needless to say that the customer was furious and felt extremely insulted by the unexpected comment. 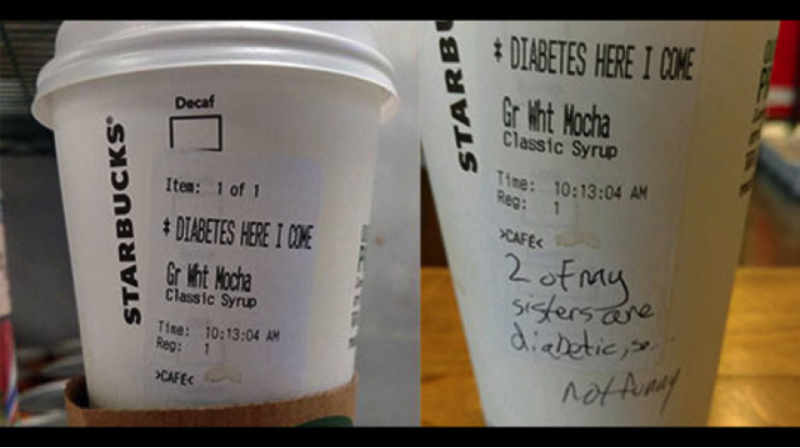 Moreover, what the barista didn’t know was that the customer had two sisters who struggled with type 1 diabetes, which added insult to injury. News travel fast these days and an incident like this could be a big blow to a brand’s public image. Thanks to social media every individual has the opportunity to be a publisher regardless of his/her background or resources. This is why a faux-pas that could have gone unnoticed in the early 1990s becomes highly publicized in this day and age. As someone who works in marketing, I can empathize with an employee who is struggling to internalize a product or service he/she doesn’t believe in. In no way does this justify what the barista did but it could help uncover an underlying problem that Starbucks might have in its hiring strategy. The obvious first reaction to an incident like this is “the employee should never have worked for Starbucks in the first place.” And that makes perfect sense. If you don’t think that people should be drinking sugary beverages, perhaps a barista job is not the right career choice for you. But what about the people behind the scenes who made the decision to hire this individual? It is not for everyone. It will probably defy some traditional schools of thought but I think the Starbucks example makes a strong case for it. The front-line employees are the ones who deal with real customers on a daily basis. Not only do they represent the brand with their behaviour, but they are also seen as the face of a company by customers. If a problem occurs such as the one in the Florida Starbucks location, the frustrated customer does not think about the VP of Marketing or the CEO. To that customer, the barista who wrote that note is the representation, the extension of Starbucks. Interactions like the one between a barista and a customer happen hundreds of times every day, all day long. Those interactions are the main points of contact between the brand and the consumers. When we receive great service in an establishment such as Starbucks, we tend to attribute this to the company rather than the individual who provided the service. We tend to believe that there is a great training program that empowers and encourages the employees so that they can provide outstanding service. For Canadian readers, WestJet is an excellent example of this. As a company, WestJet made the decision to eliminate middle management so that the front-line employees can be empowered to make more decisions at their discretion. This is an incredibly powerful way to develop leadership within entry-level positions. The unfortunate flip side of this is when an incident happens where an employee makes a bad decision, it can bring the brand down on a larger scale. Strategic hiring is critical for companies. In fact it is so critical that it might make or break a brand. Perhaps a company like Starbucks has enough brand strength to survive these isolated incidents but if they keep making the same hiring decisions, these isolated cases may become regular and damage the brand. Job seekers have just as much responsibility as employers in making the right decisions for themselves. If you somehow end up working for an establishment that you fundamentally disagree with, you still have the responsibility to represent the brand in a manner that is acceptable to their standards. In order for everyone to win, companies need to be able to successfully communicate and train their employees on their brand, and employees need to actually share these brand values. Starbucks is a brand that is renowned for its employee training program but there is only so much that training can achieve if the wrong people are hired.